Renert Programs is one of the leading student guidance centers based in Calgary, Canada. Since 1992, Renert Programs offers academic services to students across Western Canada and specializes in academic test preparation for LSAT, GMAT, MCAT and diploma examination reviews. The center also offers tutorials for various math and science courses. The Renert School, an exceptional academy with state of the art teaching methodologies and an advanced curriculum, was also launched in fall 2013. Renert Programs needed a functional and comprehensive website that could serve as a complete portal for students enrolled in the center, as well as applicants looking for helpful information. We are proud to say that 99MediaLab was selected for the job and the end result speaks of the level of quality that we provide. Our aim was to create a sleek and professional website for Renert Programs that not only catered to the diverse needs of the educational center but also brought in increased traffic and leads. Renert Programs needed an easy to browse and streamlined website layout that provided helpful information in small sectioned chunks without making the interface too cluttered. Therefore, we kept the homepage simple and sophisticated, with quick to follow navigation links to the rest of the website. The addition of small tidbits, images and SEO friendly content not only made the website easy to comprehend for users but also worked towards increasing its visibility in search engine results. Our team also added the guidance information as well as upcoming events on an easy to access section on the front to make the website all the more functional and navigation-friendly. At 99MediaLab, we focus on a customized design and unique approach for every client we cater to. 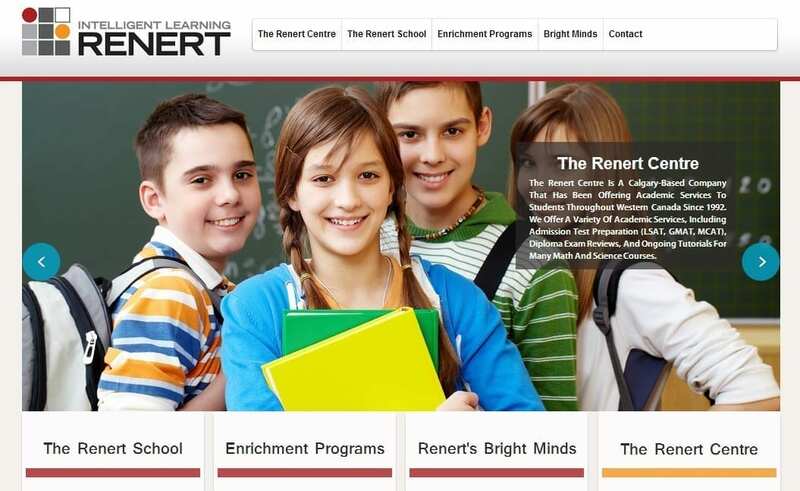 Being an educational guidance portal, the Renert Programs website had to be constantly updated. To make sure that the process was easy for our clients, we chose a simple and user-friendly layout that wasn’t complex to handle and could be used without any technical experience. Aside from the website design, our web design team worked alongside our SEO team to make sure that the added features also brought in more clicks, more traffic and ultimately more business and recognition for Renert Programs online. • Content Management System: The creation of a sound, professional yet easily manageable content management system was the first aspect we had in mind when designing a website for Renert Programs. We used a WordPress template, as it is the easiest to use and comes with the most comprehensive options available. The CMS for Renert programs was designed in a way that it could be customized in an array of themes and provided complete flexibility to update pages and add or remove content simply with just a few clicks. • Mobile Responsive: To make the website easily accessible on smart phones and portable devices, our web development team chose a mobile responsive design that could adapt and automatically update to the size and layout of various smart devices. This makes the website easier to browse with all its features available on smart phones as well. • Search Engine Optimized: Increasing the overall SEO-friendliness was an integral part of the website design and development. Our SEO team conducted a customized research for the most searched keywords and added them in the content following the latest updates by Google. Also, the Meta links, tags and headers were also SEO optimized to bring a boost to rankings for both local and national searches. • Social Media Integration: As Renert Programs basically caters to students and youngsters, having a strong social media presence to fuel its growth was extremely important. We linked the main website with some of the leading social media pages for the education center and added buttons for Facebook, LinkedIn, Twitter and YouTube on the main page. Our collaboration with Renert programs was a great experience and everyone on board, from our web design gurus to SEO specialists put in their best efforts to make the project a shining success. And the results say it all – in just a few weeks after going live, the incoming traffic for Renert Programs has almost doubled and the search engine rankings have also improved considerably.